We are happy to share with our readers news that the church of the Holy Rosary in the Bronx, New York, is adding a monthly Mass in Extraordinary Form to its Sunday schedule, beginning this month. 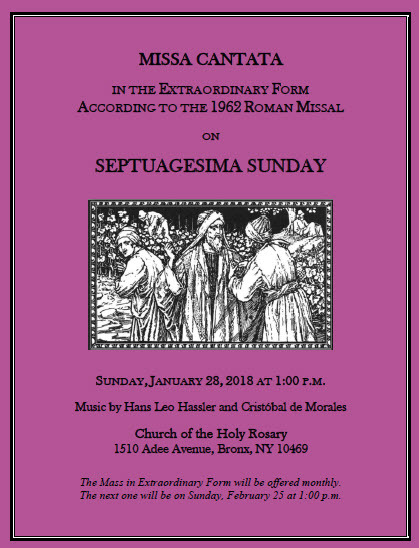 The first one will take place on Septuagesima Sunday, January 28, at 1 pm, with music by Hans Leo Hassler and Cristóbal de Morales. The church is located at 1510 Adee Avenue, and accessible by public transportation; parking is also available.